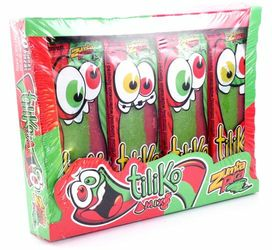 Zumba Pica's Tiliko is a soft caramel candy with a scrumptious mixture of tamarind and watermelon flavors. One taste and it will drive your taste buds wild with its mildly hot taste. Its a great snack on the go and kids love it as a lunch box treat. Try it today and enjoy the tangy taste of Tiliko. Soft caramel candy, with tamarind and watermelon flavors. Ingredients:sugar, corn syrup, maltodextrin, water, citric acid, iodized salt,chili powder, guar gum, sodium tripolyphosphate, sodium acidpyrophosphate, preservatives (sodium benzoate and potassium sorbate),artificial flavoring, red 40, yellow 5, yellow 6, and blue 1. Zumba Pica's Tiliko es un dulce de caramelo suave con una mezcla exquisitade sabores: tamarindo y sandia. Pruebalo y veras como volvera loco atu paladar con su sabor enchiloso y agridulce. Es una golosina quepuedes comer en cualquier parte y a los ni�os les encanta! Prueba ydisfruta el gran sabor de Tiliko! Carmelo suave con sabor a tamarindo y sandia. Calorias: 40, Sodio 130 mg.
Ingredientes:azucar, glucosa, maltodextrina, agua, acido citrico, sal yodada,chile en polvo, goma guar, tripoifosfato de sodio, pirofosfato acidode sodio, conservadores (benzoato de sodio y sorbato de potasio),saborizante artificial, rojo allura ac (rojo 40), amarillo ocaso fcf(amarillo 6) y azul brillante fcf (azul 1). They remind me of Airheads but spicy, sweet, and salty. Very good!